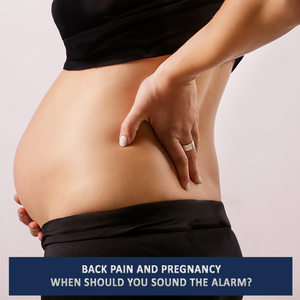 When should a pregnant woman become concerned about back pain? When the pain from the back radiates to the front of the uterus. This could indicate contractions and indicates a phone call to your provider and possible trip to the hospital to be checked, especially if you are in the late second and early third trimester. 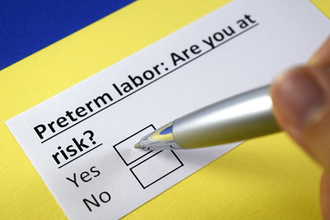 Preterm contractions are sneaky and sometimes masks itself as low back pain when in truth, it is preterm labor. When back pain is associated with burning or painful urination. It could be a sign of a urinary track infection, that if untreated, can cause preterm contractions and a condition called pyelonephritis which means both the kidneys and bladder are infected. Pyelonephritis is extremely dangerous because if untreated, the bacteria can enter the bloodstream and cause sepsis which means all the body systems are infected. Common sense strategies including wearing low-heeled shoes, not lifting heavy objects and sleeping on your left side rather than flat on your back helps to reduce non-high-risk pregnancy back pain. While most back pain during pregnancy is usually not high-risk related, being aware of potential problems empowers you to reduce complications, before they spin out of control. Follow Dr. Linda on Facebook | Order your copy of The Smart Mother’s Guide to a Better Pregnancy: How to Minimize Risks, Avoid Complications, and Have a Healthy Baby | Dr. Linda is a board certified Ob/Gyn and an expert in the area of pre-eclampsia and high-risk pregnancies. Contact Dr. Linda about an appearance at your next event or media placement opportunities. Join the email list to stay informed and never miss a blog post.